Low-Till and No-Till Farming have been on the minds of many of our WNC CRAFT Farmers over the past few years. In short, no-till and low-till farming models aim to disturb the soil structure as little as possible. So traditional moldboard plowing is out in favor of techniques that loosen the soil without turning it over, and keeping the soil covered. Benefits can include improved water-holding capacity, increased microbial life, increased organic matter & soil health, reduced erosion, and less carbon dioxide released into the atmosphere, among others. Conventional farmers, in some ways, have been leading the way in these models with intensive cover cropping and equipment, like seed drills, better suited to larger scale farms. But, they often use herbicides to deal with weeds. For small-scale organic and sustainably focused growers in different parts of the country, the approaches need to be more specialized. Two WNC CRAFT farmers, Goldfinch Gardens and Against the Grain Farm, attended a workshop at Singing Frogs Farm in Sebastopol, CA in October 2017 to learn more about how they incorporate low-till techniques on their farm and see what they could glean to bring back to Western NC (WNC). Both farms received Farmer Professional Development Scholarships from Organic Growers School to attend. Read about their experience in their own words here and here. 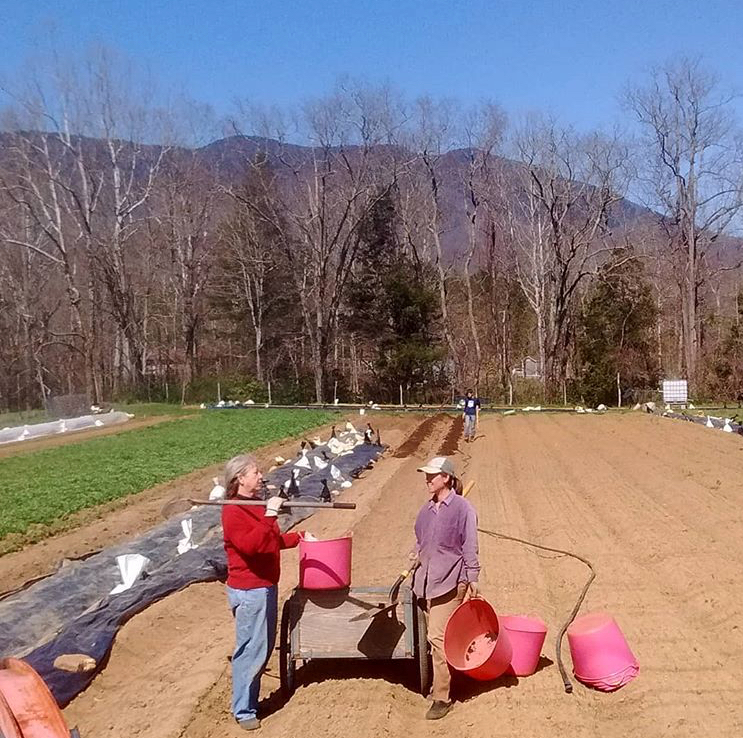 For the last WNC CRAFT Farmer Round Table, we wanted to hear more about their experience, how they’re incorporating what they learned into their own farm business, and hear from other farmers that are experimenting with low-till farming models, too. Ben and Cedar, the farmers at Goldfinch Gardens shared their experience, and then we jumped into group discussion. Here some notes from that evening to keep the discussion going! They do lots of education at Signing Frogs, and have good Youtube videos! Signing Frogs is very dependent on inexpensive, high-quality compost they are able to buy from their County. They employ lots of flowering annuals and perennials throughout the farm. Since they don’t use a tractor they are able to plant 2-ft of beneficial plants at the head of every row/bed. They also have permanent irrigation heads on each bed. Tall, wild, and woody hedgerows are integrated throughout the farm offering windbreaks, and beneficial insect habitat. Landscape fabric keeps the pathways weed free. When they are transitioning a bed from an old crop to a new they will leave the root mass from the previous crop in the ground, cutting the plant off just below the soil surface so that the root exudates are still active on the roots. Next, come feather meal and compost. They will broad fork some beds as needed. Then, they transplant directly in the bed. They only use transplants because it is can be difficult to direct seed in a low-till operation since there is more residue left in the beds. If you’re using a seeder the bed needs to be well tilthed creating a fine, residue-free planting surface. While they do have drop irrigation at Singing Frogs, Ben & Cedar were inspired by how little they water, and still have good crops, especially in an arid climate. They do use a lot of hand labor on the farm too with 5-6 employees throughout the year. At Goldfinch Gardens Ben & Cedar are in the process of moving toward more low-till. With crops like peppers, tomatoes, and lettuce they are doing a similar planting process to what they learned at Singing Frogs and it seems to be working. They do use a seeder still but are trying to get away from it, because it requires some tilthing. While it is not very invasive it still pulverizes the top few inches of soil. They did buy a Jang seeder with a high residue foot so they can hopefully plan in higher residue beds. They are switching to more transplants so they don’t have to direct seed as much. Tarps have proven to be an effective low-till tool for them. They lay the “bunker tarp,” out over a section after it’s been harvested. The tarp is black on one side and white on the other. After 2-3 weeks, peel it back and all the residue is gone. The tarp will kill plants by keeping the sun out, but maintains a warm, moist environment that promotes decomposition and microbial life. They are hoping to be able to cover areas in the early spring, so when they are ready to plant they can simply peel it back, spread compost and transplant without spading. Ben built a 3-shank chisel plow, that is like an upscale version of a broadfork. It will work for one bed at a time, breaking up the soil, but not turning it over. And, it is faster than a spader and keeps the bed shape. They are trying to use it sparingly though. While its too soon to gauge if their soil quality has improved, they do feel like their productivity is increasing. Rotations are getting tighter, they’re getting more productivity out of a bed, and using less labor to form a bed. At Away of Life Farm, Jamie & Sara Jane have been using minimal tilling for several years. Early on they invested in a Keyline Plow, which is a modified chisel plow with 2 shanks that are 16 inches apart, with a C-shaped foot. It lifts the whole bed without turning it over. They are using tarping, too! They prepped a bed, and covered it with a tarp when it was dry. Then they were able to plant in it this very day despite rainy conditions. They will flail mow or weed whack down whatever is in the bed section if it’s overgrown, and put the tarp down. A benefit of these techniques is that they’ve been able to reduce their growing space without losing production volume. But, using tarps does have a scale limit, most likely. At some point, a farm can be too big for tarping to be efficient in terms of cost and labor. And, Jamie mentioned that no-till doesn’t work against tree roots. If your fields are lined with trees you will most likely need to knock back the feeder roots with tillage on the edges of your field. Plant cover crop, then cut it down after the seed head has formed. Timing is everything with this method. Theoretically, once the seed head form and its cut down, the plant won’t come back. Thank you to Ben and Cedar for facilitating this great Farmer Round Table!